Cut the tops off the peppers, dice up these tops and set aside for step 3. Next, in a medium-sized bowl add the diced tomatoes, salt, pepper, cayenne pepper, onion powder and garlic powder, stir. Take out 1 cup of this tomato mixture and add it to the bottom of a 6-quart slow cooker. Using that same bowl that has the rest of the tomato mixture left in it, add the rice, garlic, onion, diced bell pepper and diced kielbasa, stir. Stuff the peppers that you have prepeared in step one. 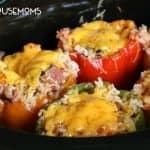 Place the stuffed peppers on top of the tomato mixture in the slow cooker. Top with cheese, replace lid for 5 minutes.